There are a lot of differences between American English and British English, therefore Texas Instruments had to change the Speech-ROM's of the original Speak & Spell to sell it on the United Kingdom market. Even the Speak & Spells with the United Kingdom Speech-ROM's reveived all three designs, don't miss the early UK Type 1 and the later UK Type 3. Compare this red Speak & Spell with the blue Buddy, introduced in the same year in Germany, the French speaking La Dictée Magique or the colorful Grillo Parlante sold in Italy. 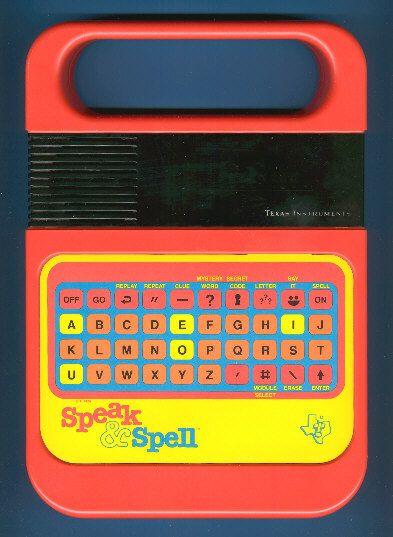 In 1984 we knew a total of 10 different plug-in modules for the Speak & Spell, a comprehensive overview including the wordlists could be found here. There are vast differences in culture between Americans and their British Commonwealth counterparts throughout the world. British English is spoken throughout the British Commonwealth of 54 countries, some of the most notable being the United Kingdom, Australia, New Zealand and South Africa, with Canada being the exception. Although part of the Commonwealth, Canadians tend to speak a mixture of American and British English due to that country's proximity to the USA (although they spell the British way). From "A guide on the differences between American and English culture" © Bruce Longman, 2000. © Joerg Woerner, July 13, 2005. No reprints without written permission.